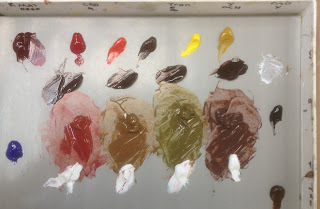 The science of color mixing can be very important for the student to grasp early. We were taught color theory in art school, but the actual skill of mixing colors and values was left to chance and experimentation. Working that way can be frustrating and time consuming, but need not be so. Over the years we've researched traditional methods of color mixing as taught by the old masters and the Academies in Paris and the great portrait painters such as Zorn, Sargent and Sorolla looking for a reliable, logical system which would serve our art. 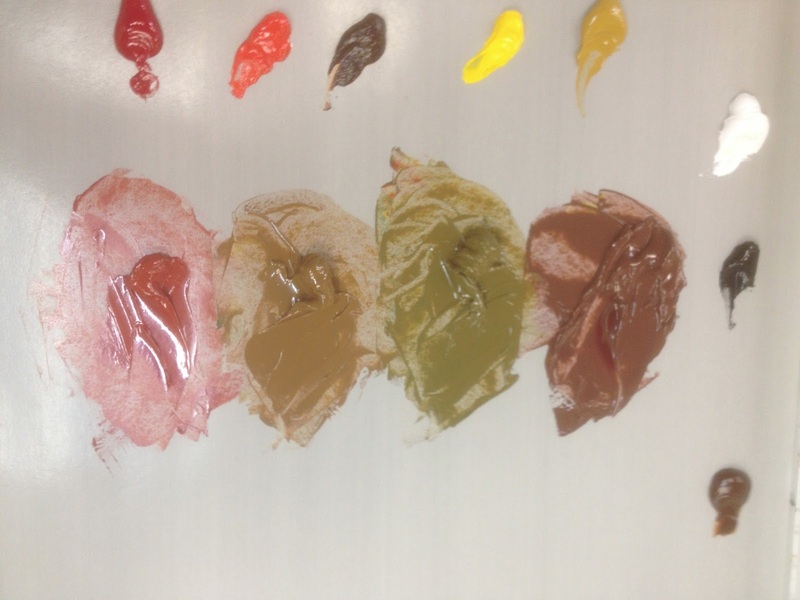 This research led us to “color strings”, which are simply premixed layouts of the major color masses in our subject, from warm to cool, and dark to light. This has several compelling benefits which we find useful. First, by identifying and mixing the major mass-tones at the very first, we avoid the mistake of continuously remixing slightly different colors throughout the course of the work. This ensures that the color scheme of the work remains harmonious and clean. 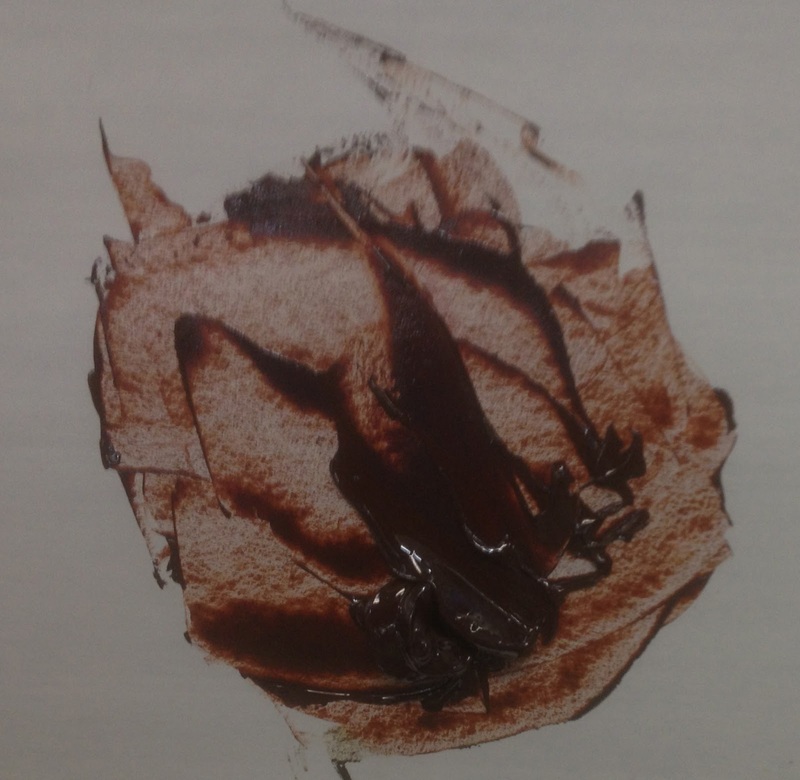 Also, by premixing, we are able to speed up the painting process and work uninterrupted by the need to mix new paint. 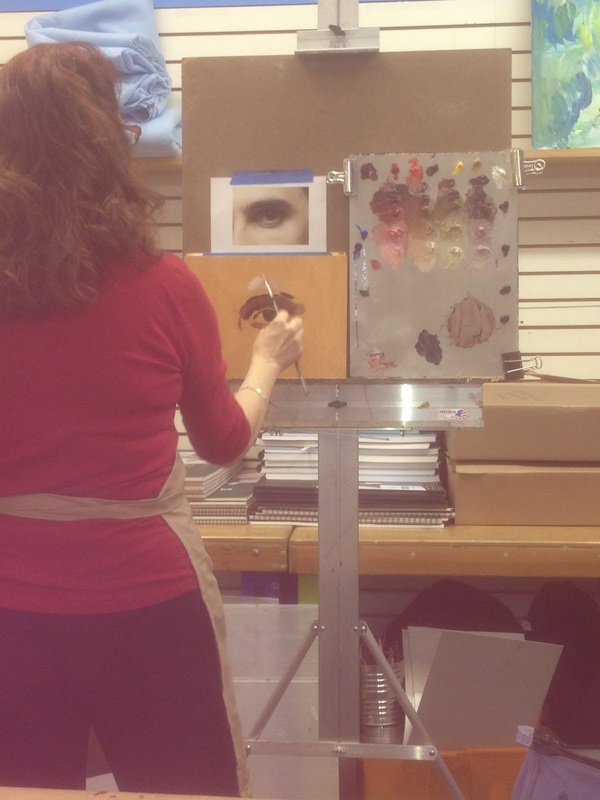 In addition, by having our cools, warms, highlights and accents already on the palette, value and temperature comparisons can be made and selected quickly and accurately, thus saving much overpainting and scraping out on the canvas itself. 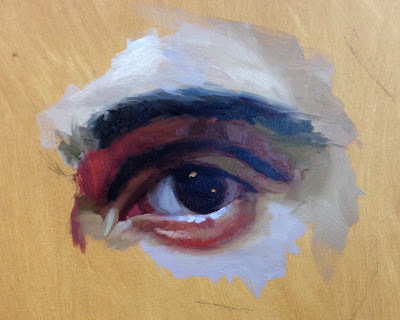 We found this demonstration of the use of a color string in portrait painting on Terry Strickland’s website and asked her permission to republish it here. 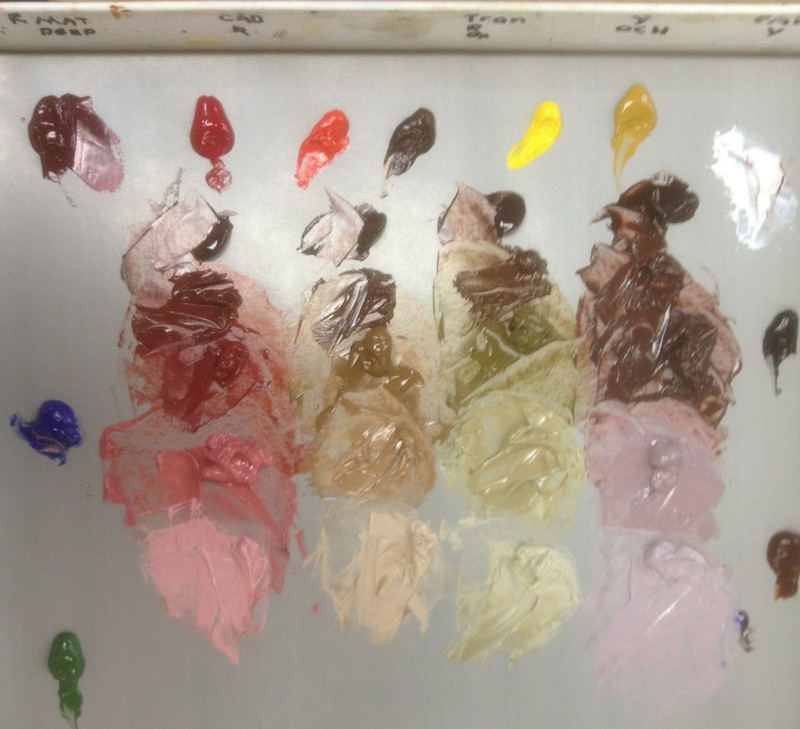 For more on this topic, see Color Mixing Secrets for the Plain Air Painter. This is what I have developed over the years. It works for me. I am constantly trying new things but for now this is my go-to starting place. 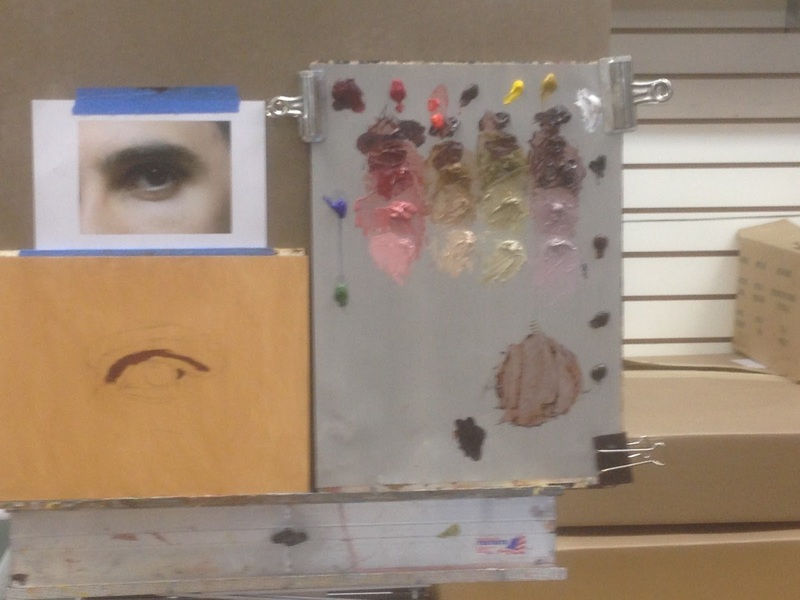 I develop 4 basic flesh tones. Having a method helps me and seems to help my students. 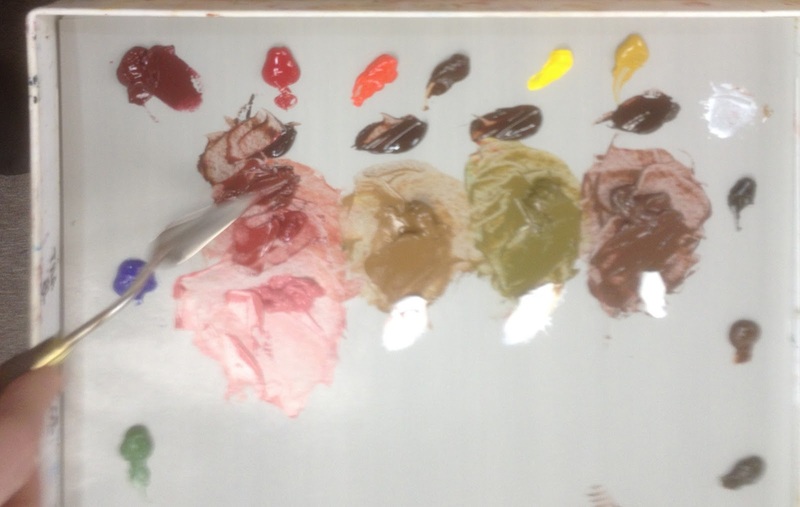 This is my standard palette. They become what I think of as a pink flesh, a golden flesh, a green flesh and a putty flesh. I then place a bit of the dark mixture above each color pile leaving some room between it and the base colors I just mixed. I then mix a little of my base colors with the dark to get a light shadow. Next I add white to the base colors to get two lighter tones. So I end up with 4 strings of 5 values each. Work from the base color down adding white. This keeps white from polluting my shadows and allows them to stay transparent. 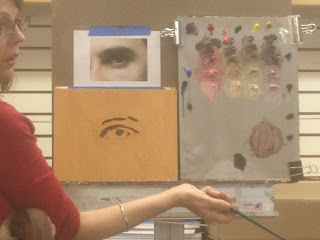 If I'm using a dark mix and decide it is too dark I add more of the base color NOT white. This prevents the shadows from getting chalky. 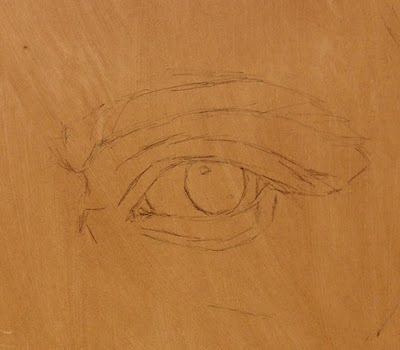 I begin with the darkest, deepest area, the crease in the eyelid. If I'm painting a light mix and want it darker I add more of the base color not the dark brown mixture. 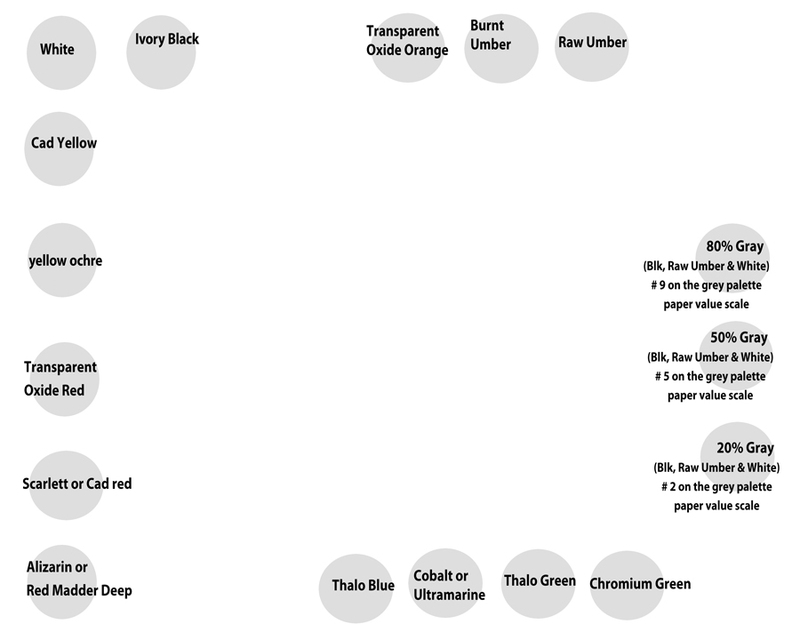 When I'm painting an area with a certain value, I move sideways on the palette. For example, if the area on the painting I'm moving to is the same value but greener I'll just slide over and grab a little bit of the green flesh tone that's the same value. If it's the same value but pinker I'll slide over and grab a bit of the pink flesh from the same value line. Squint to see shadow shapes. Paint on a bit of the lightest area, (not the highlight, that's last). In this case the area above the eyebrow, a cool light flesh color. This gives you a range of color from the darkest to the lightest. Everything will now be judged in relation to these two color/value points of reference. I paint in planes, adding facets of color where I see them, trying to match value and pushing the color. By that I mean that I make it as colorful as I see it and then some. I can always dull it down by adding a neutral or an opposite color later on but it's hard to get back to pure color when it gets too muddy at the start. I have aded a bit of cad red to pump up the color under the brow and under the lower lid. 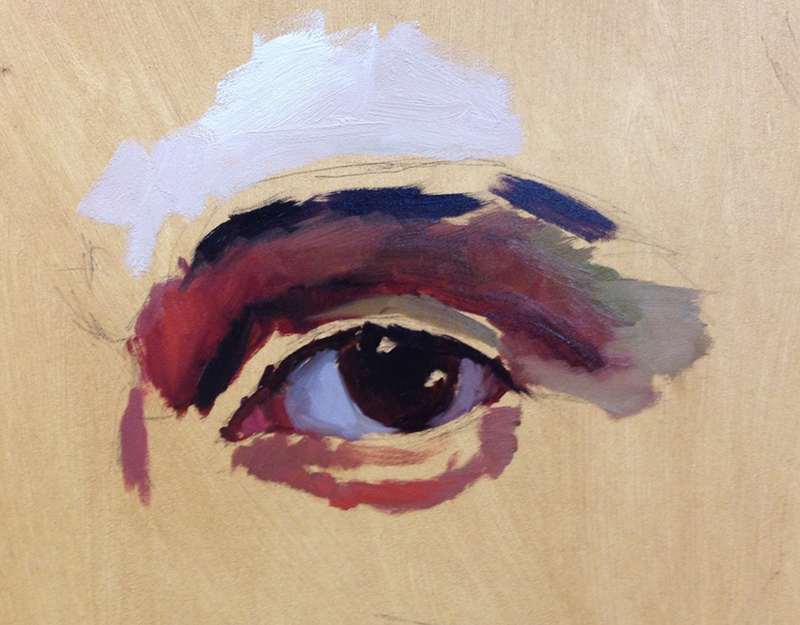 The white of the eye is basically a cooler flesh tone. I added cobalt/ultramarine to achieve that. Closing in now, I smudge the planes of color together a little bit, softening edges. If I planned to work on the painting for a second pass I'd make sure there were no big ledges of paint left by brush strokes. Big ledges left behind are problematic if you decide to move a line later. Actually I couldn't resist working on it a bit more. I refined the shape of the iris, toned down the reds under the brow, and worked on the eyebrow a bit. There is a lot more I could do but it's just a study so I'm calling it done. and reprinted here with permission. 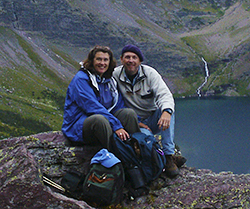 Terry Strickland graduated with a degree in Graphic Design from the University of Central Florida. 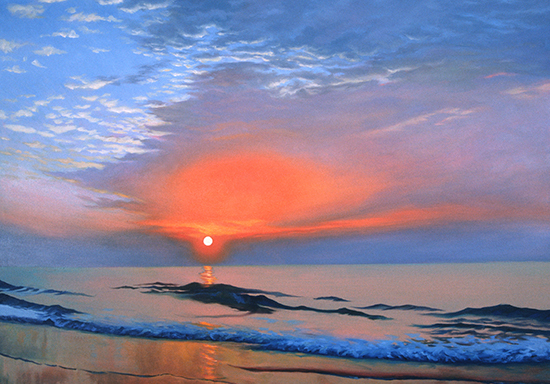 She pursued a career in graphics for several years before devoting herself full-time to her fine art work in 2005. 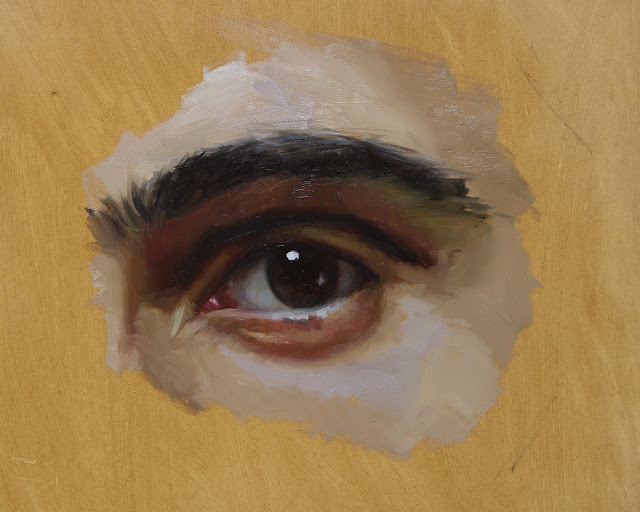 Since then she has become well known for her portraits and still life work. 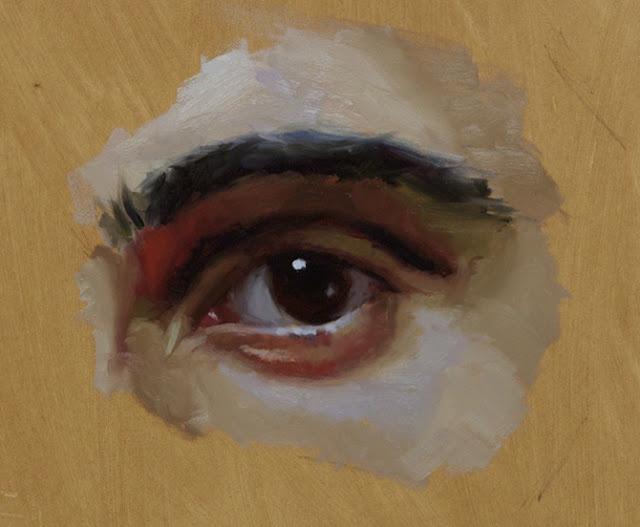 She writes: "I'm intrigued by the idea of a work of art looking like an old master's painting but with a contemporary edge, as an artist I want to be a filter for the time I live in. I'm frequently inspired by fairy tales, superheroes, or works of literature, and reexamine them in a contemporary way. Mythical characters may become a device to explore our responses to modern day situations, for example Superman becomes a symbol for the mighty dreams each of us hold close to our chests." Artist Terry Strickland shares with The Artist's Road her color string mixing techniques in painting portraits.